US2012: Where on the election map is Africa? No matter who wins the presidency in next week’s American elections, renewal of the African Growth and Opportunity Act in 2015 is likely to be centrepiece of the continent’s relationship with the US. African nations must make the case that the Act is to the benefit of Americans as much as it aids Africa’s growth. By J BROOKS SPECTOR. Sometimes a presidential election takes its pitch and timbre from foreign shores. Woodrow Wilson won re-election in 1916 with the slogan, “He kept us out of war”. Never mind that a year later he led the nation into World War I.
John Kennedy beat Richard Nixon with a demonstration of “vigour” and youthful energy, but also because he was more assertive on the defence of Quemoy and Matsu, those tiny islands just off the coast of China but still under the control of Taiwan. Eisenhower carried the day in 1952 with his pledge “I will go to Korea” to personally create an end to that war, although he almost certainly would have won even without such a statement. Vietnam provided the texture for several presidential elections, but Richard Nixon won two of them anyway. And, of course, the Iranian hostage crisis helped propel Ronald Reagan into office over a hapless Jimmy Carter. Iraq might have been the defining issue for the 2008 election, except that the financial meltdown usurped centre stage instead. And that’s the point. American presidential elections are almost always fought over domestic issues. It’s not just “it’s the economy, stupid,” but it is also, “it’s the economy, all you smart guys” too. This close focus on domestic economic issues, together with the never-ending squabbles over social policies around miscellaneous bedroom issues, has generally pushed international affairs into a kind of ghostly appearance in this campaign. There it is, then there it isn’t. Moreover, rather than real debates about underlying, fundamental issues or differences, foreign policy as a theme comes in as a quick dust-up over Iran’s nuclear future. Then it is the attack on the US Consulate in Benghazi, Libya; then that is quickly followed with a few harsh words about China’s presumed exchange rate policies and their effects on jobs. For months, Mitt Romney, the Republican nominee, had been charging President Obama with being the apologist in chief for America (that so-called “apology tour’ that never really happened); of having thrown Israel “under a bus”; of failing to defend America against predatory Chinese international trade tactics; and allowing Iran to continue its presumed march towards becoming a demented nuclear power. 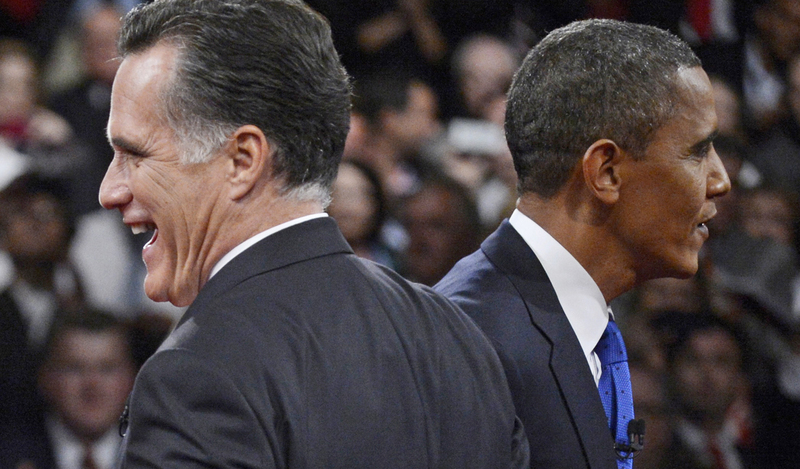 Then, as if by some kind of legerdemain or Vulcan mind-meld, in the third presidential debate, Romney did almost everything he could to embrace the broad outlines of the Obama foreign policy experience – as well as many of its specific actions – as part of his ongoing pivot to the centre. If this sudden movement confused American voters, it almost certainly has confounded international observers even more. From this vantage point in Africa, there are three questions to ask: First, are there actually any fundamental differences in the way the two men would conduct the nation’s international relationships? Second, how would policies towards Africa be different – if at all? And, third, what are the key expectations from Africa towards an American president, whoever he is? Or vice versa. Only a month after Barack Obama won his 2008 election, this writer co-authored an article that argued even as the election campaign was taking off in 2008, the international financial/banking crisis overwhelmed almost every other issue. Obama’s crucial challenge, then, was to convince American voters he was the right man to deal with financial and economic crises. Everything else was second tier. But beyond the banking crisis, other pressing international issues meant Africa’s concerns would not replace US relations with China, with Latin America, with Russia, or the Middle East, or Afghanistan or Iraq in the hierarchy of important issues. In this environment, if Africa gained a visible policy presence it would, for the most part, come by being part of global, trans-border concerns like terrorism, global environmental and climate issues, international crime networks, or pandemics. So far, at least, there is no reason to assume these overall circumstances will change dramatically, given the global economic fundamentals. Before the final presidential debate, much of the strident Romney foreign policy critique centred along five axes: the unfairness of China trade; the Iranian nuclear issue and the concomitant unwavering support for Israel; ensuring maximum military strength; strenuously dealing with international terrorism; and responding to the onward ripples of the Arab Spring (and the consequent perils of nation-building). But by the time the final presidential debate, on 22 October, was over, it had become clear the Romney candidacy had by and large embraced the broad outlines of American foreign policy as laid out by Obama. It seems Romney is now increasingly buying into the foreign policy weltanschauung of the geopolitical realists and “economics and trade trumps troops” people like Robert Zoellick and Richard Haass – versus neoconservative carryovers from the Bush administration like John Bolton. If true, a Romney administration – just like the current one – would end up focusing on advancing American interests through trade and economic relationships. It should be noted, however, that aides like former Ronald Reagan advisor Richard Williamson; former Air Force general, National Security Agency and CIA head Michael Hayden; and Dan Senor, the former spokesman for the (unsuccessful) Coalition Provisional Authority in Iraq also had important roles, early on, in guiding and shaping Romney’s thinking on foreign affairs. Unlike so many other previous presidential candidates, Romney has had very little foreign policy experience or time spent thinking on it. Given his “I agree with Barack Obama” performance at the end of October, a Romney presidency increasingly looks like it would fit into the prevailing practices of the post-cold war foreign policy paradigm. There is one important – and troubling – footnote here, however. There s likely to be continuing to pressure from congressional Republicans for a draw down on American foreign aid commitments. While it is unlikely they would consider cutting aid to Israel, it is not beyond the realm of possibility to see greater pressure on aid to those countries that have more difficult relationships with the US, or to those that transgress democratic norms and practices as defined by Republican representatives. At this point, Africa has barely featuring in the foreign policy debate between the two candidates, and when it came up when Romney took a more strident tone about the impact of non-state terrorism in countries like Mali and Libya. So it is possible to see more American foreign policy energy directed against such movements. At the same time, however, it would be unlikely to see a Romney administration advocating, let alone carrying out, the deployment of increased military boots on the ground in a place like Mali. The US is so clearly tired of long, lonely troop commitments such as the one in Afghanistan, that it is extremely difficult to see how new commitments would be contemplated, let alone carried out. That would inevitably lead Romney, too, to a reliance on multinational organizations and ad hoc configurations – the distained “leading from behind” but called something else, perhaps. While this will include aid, it will – regardless of whoever is president – increasingly be dominated by trade. This will be important in dealing with a continent growing rapidly and with an expanding middle class and a predominately youthful population. From an African perspective, even with its imperfections, renewal of the African Growth and Opportunity Act – a measure due to expire in 2015 – should be a top priority for the African nations. It is important to remember that this is American law, not an international treaty. If African nations want to continue its provisions for duty-free entry into America, they are going to have to help make the case to America’s Congress as to why it is to the benefit of Americans as much as they argue it aids Africa’s growth.